I was inspired by the Jo’s (at Jo’s Country Junction) UFO Challenge to machine quilt & bind my Easy Street quilt top. The challenge is to finish UFOs made from Bonnie Hunter’s patterns before her next book comes out in September. The original mystery made a queen sized quilt, but I made mine a large twin at 75″ x 96″ even though I had sewn all the parts to make the queen. The plan is to use the leftover pieces to make some pillowcases, but I am not sure when that project will land on my list. I used a medium gray thread for the center and machine quilted free form Baptist Fans. 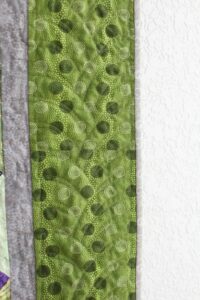 On the border I used a green thread and machine quilted a braided border design that I learned in one of my classes in Salt Lake City. 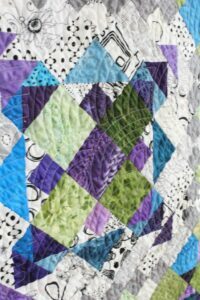 I am very happy with the machine quilting on this quilt. My plan was to quilt two bobbins a day, relaxing and just enjoying the whole experience instead of a mad dash to have it finished and I think that the plan worked. 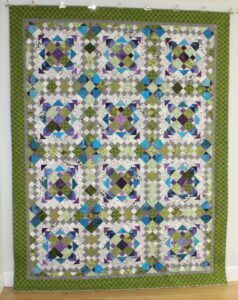 Now it is back to piecing on Garden Party which is also a Bonnie Hunter design. I hope to have this top finished by the end of the month, but this is new project not an UFO. Check out all the other progress at Jo’s Country Junction.